The Smart 50D printer from IDP is designed for in-house production of dual sided plastic cards; Easy to use, highly reliable and cost effective to boot. What are you waiting for? Start printing today. The IDP Smart 50D printer is Ireland’s best-selling plastic card printer for printed plastic cards, and with good reason. This compact dual-sided printer is packed full of technology – plastic card printing has never been easier, or more affordable. 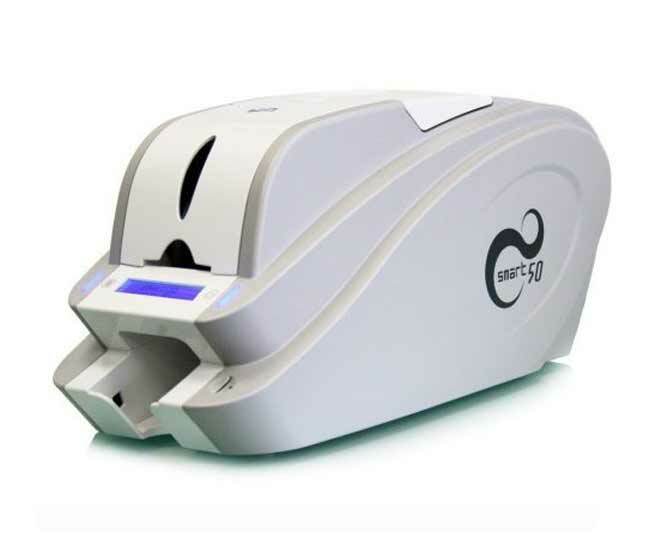 The 50D is great for a whole host of plastic card applications: Staff ID Cards, Student ID Cards, Membership, loyalty, gift cards; the list goes on. Featuring all of the attributes of its larger (more expensive) counterparts: IDP’s clear print technology with FINE imaging promises crystal clear colorful images; An internal flipper allows for auto printing on both sides of cards. Optional encoding technology allows for magstripe & smart card encoding. Take advantage of the costs savings associated with owning a Smart Printer: Free bundled design software, low-cost consumables & maintenance all enhanced by an unrivaled 5-year manufacturers warranty.